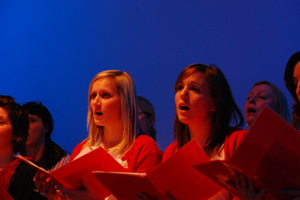 Jack Morton Worldwide staff have formed a choir and performed at a Christmas fundraising event. The Jack Morton Chamber Choir, comprising 22 staff including managing director Julian Pullan, held the event in aid of Macmillan Cancer Support. The choir rehearsed weekly for two months under the leadership of staffer and professional singer Lloyd Griffith, who regularly sings in Westminster Abbey and St George's Chapel Windsor Castle choirs. Jack Morton's choir performed at the agency's London office on Wednesday evening this week to an audience of colleagues, family and friends. Jack Morton raised £500 for Macmillan Cancer Support. To see a film of the Jack Morton Worldwide London office, click here.